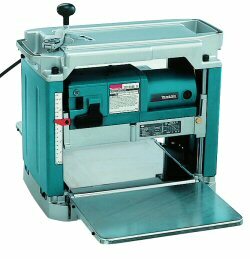 I'm looking to buy a thicknesser but can't seem to decide between the Makita 2012nb and Metabo dh330. What I like about the Metabo is the higher power rating and that it has a gauge on the infeed that shows how much you're taking off. What I like about the Makita is the lighter weight and lower decibel rating. Anyone here who's had to make a similar decision or that has used either machine? Can't speak about either one, as I just converted over to the Dewalt 735 a couple of days ago, but just a small comment about the gauge. I find the material removal gauges on thickness planers to be pretty useless. The one function they have for me is to let me know that I'm in the ballpark on the first cut, so that I'm not taking off so much that I stress the machine. Thereafter, though, I'm relying on how far I turn the wheel and digital calipers to set the next cut. But in truth, if the gauge from my thickness planer suddenly disappeared tomorrow, I would not miss it. Same here. I have even tried the Wixey digital gauge which does work pretty well. I have the original one and batteries seem to go in about 6 months, doesn't seem to matter how much you use it. I think the second version uses AAA batteries, mine is a button cell. I use a digital caliper most times and the thickness gauge to ensure I'm not biting off too much on the first cut just as you do. - unless you are carrying the machine from site to site, the weight itself (on a bench or on castors) doesn't matter and you will still need to wear ear protection regardless of the lower db rating. - on the other hand, the power and gauge on the Metabo are more useful features. Unlike the other comments about the gauge, I find the depth gauge very important for thicknessing boards with no or the least machine marks on the surface as well as avoiding or minimizing snipes (mine is the Ridgid http://tinyurl.com/y8c5rwxb ($500 Cdn or less at sale time)). The depth gauge is NOT designed to tell you the final thickness of the stock has been planed, but rather, it keeps you from over-planing when you turn the depth wheel. To plane all boards to the same thickness, in the case of the Ridgid, we use the Repeat-A-Cut adjustable depth stops. The Ridgid machine alone can produce boards of identical thickness of your choice using one of the 8 adjustable depth stops, without using any calipers. And I have never needed to use a caliper in any stock preparation. I used the Dewalt 734 before the Ridgid and found Ridgid a lot better in preventing snipes and in dust collection. With proper set-up and techniques, I can get snipes-free boards a lot of the times. You may also consider which of the two machines has a better snipe control feature. I have the makita. I like it. Miles better than either dewalt. Lighter, quieter, just works better. Never seen the metabo before. I have the Dewalt 735 and it works great. I like The 4 post design over either of these two units. I think the key thing to look for is a depth stop, so that you can easily get all your boards the same thickness. I liked my Dewalt 735. But I sold it when I bought a 15" powermatic. I never used it out of the shop. That's a machine in a different class (240V, 3HP). With a byrd shelix cutterhead, it could cost 6 to 7 times a DW735 or other benchtop models. Yes I understand that Chuck. What I really was saying that I was happy with the 735. And I would purchase another one if I needed to go portable. y'all consider the 735 portable ? does it not weigh 90lbs plus ? I unlike others have found the dewalts loud, overated, heavy. The makita is the sweet spot in terms of weight and portability. For the record in my opinion hitachi made the best lunch pail planer the c12 the older one with the joiner option was an awesome machine. If you can find one of those buy it. furniture are in multiples of 1⁄16 in. In the same Guide, the Best Overall is Dewalt 735X and Best Value Ridgid R4331. I believe they arrived at the same conclusions in the 2016 Tool Guide. Dewalt probably spent more on adds. I have owned both my company has the 735! I own the Makita. The crew uses the beater the Dewalt. When we need good clean cuts it's the Makita. Plus if you need one person portable the Dewalt is a boat anchor. Another vote for the DW735...mine has the Byrd head and a Wixey digital readout and it is a workhorse. Unfortunately, the choice of compact "portable" ticknessers and planers in europe is rather restricted. When I was looking for a thicknesses, I was looking at te same 2 thicknessers. I decided on the Makita. Mainly because i had a talk with a old carp who had one and he said it lasted for many many years . So based on his recommendation and the parts availability as the makita is everywhere, I am happy I chose the one I did. The makita is a awesome plane. Lighter then the delta and does a very good job at planing hard woods.